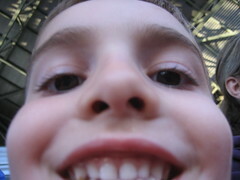 This is what happens when a 4 year old boy gets hold of your camera. My wife and I were cracking up as we imported some of the images he made of himself and surrounding objects while we attended a Milwaukee Brewer's baseball game last Friday night. I've been impressed with Nathan's eye with a camera. He's very serious when shooting, and often seems to deliberately frame shots, though many times his shows seem less than intentional. I'm planning to work with Nathan on his camera skills, so he can better understand what he's doing. Whatever the case, I find a deep, unexplainable enjoyment as I watch him explore his world and express himself through a camera lens. That's awesome! I like the abstracts. I've been letting my daughter (10) mess with a camera for a while. It's great to watch - like you said in your post. The little ones just enjoy it -they're fearless. I've started her online gallery too. She gets a kick out of seeing her stuff on my site. Doing projects together is a great way to bond. I'm always amused and impressed by the snapshots my kids get too! I am firmly in the "don't train them to use a camera" camp -- once they get "taught" by us grown-ups, their pictures lose their child's perspective. My son is learning photography on his own, and even though not every picture is a winner, I am still surprised by his untrained eye. When he gets older, and he feels he wants to get serious about photography, then I'll guide him -- otherwise, why spoil it? It's like organized sports, grown-ups have to come in with their rules and won't let kids just play and figure stuff out on their own. Kid's do seem to get lucky when they have a camera in their hands. If you buy him a digital you should try to explain the fundamentals but don't expect him to follow them. My buddy who is a photographer, among other things, set his boy loose and has shown me some great shots that were taken. Of course that was 1 out of about 200 pictures. Most were worthy of deletion. I guess my point is simply not to have too high expectations of him. If you pay a few hundred for a camera make sure you know that you remember it's for a kid and ultimately is a toy that will get a ton of interest at first and possibly lose it's appeal if you overload him with too many tips from the pro. I don't know your kid or his interest though. As long as he sees you with a camera in hand he will likely have more interest than the next kid. Sounds like he already does but at 4 years old that is the same enthusiasm for anything that daddy does you know? Thanks for sharing. I recommend something like Panasonic Lumix DMZ-LS75 since it is cheap and also offers movie mode with audio (crappy audio but better than silent for kids). I believe that is the one that was recommended to me. Actually it may be the Panasonic DMC-FX07S which almost $100 more just for 3.6x optical zoom. I think I am goign to buy the cheaper version for my 6 year old though. Actually, I take that back. There is no built in memory with the first one. Spend the extra money for the zoom and a bit of memory to fall back on once your kid fills the 2 gig card with video. You know what.. Don't even listen to me. There are too many Lumix here and besides the more expensive one does not have built in. Now I am confused. How about you recommend a camera to me instead! lol.